John Travolta, as Ben Aronoff in the movie Speed Kills (2018), receives a gold Rolex Oyster Perpetual Day-Date watch. The watch has a gold case and a gold bracelet, gold dial with index hour markers, date display at the 3 o'clock position and day of the week display centered on the 12 o'clock position. 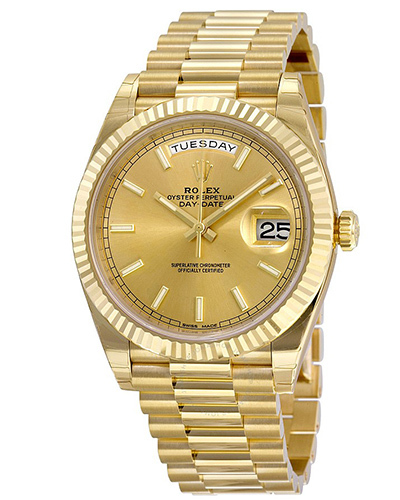 To be exact, it could be the "Rolex Day-Date 40 Champagne Dial 18K Yellow Gold President Automatic Men's Watch ref. 228238CSP". Strange detail: in the close-up image of the watch in the film, the Rolex crown logo is missing from the dial (see screenshot image on the left). In the film Speed Kills, John Travolta plays speedboat racing champion and multimillionaire Ben Aronoff, who leads a double life that lands him in trouble with the law and drug lords. The film is based on a true story.